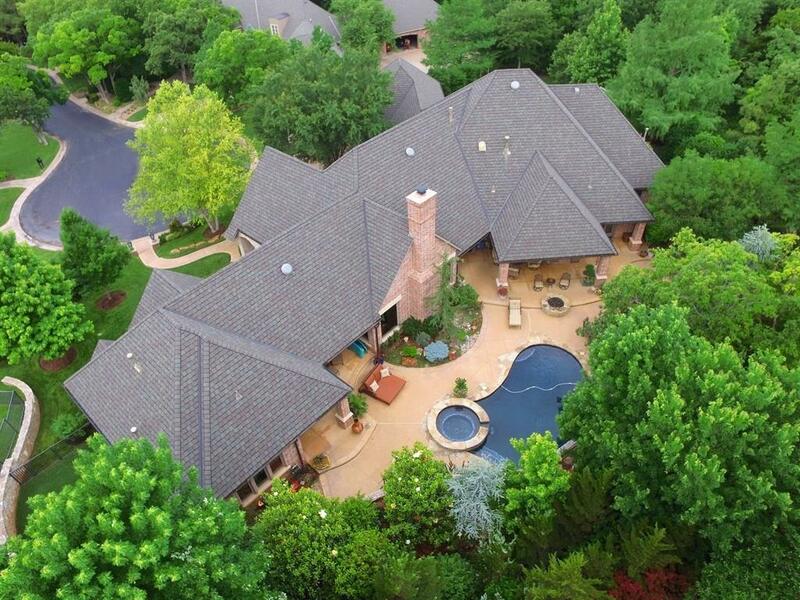 Gated Edmond community with park, playground, waterfall, walking trail & picnic area. Grand family room w/wood floors, plantation shutters, wood beam cathedral ceiling, speakers, bookcases & fireplace w/gas logs. Gourmet kitchen w/crown, speakers, breakfast bar, granite, island, walk-in pantry, 2 sinks, 6-burner Dacor cooktop, dbl ovens, Sub Zero, ice maker, Miele dishwasher. Large safe room. Handsome Study w/glass doors, wood floors, plantation shutters, bookcases, built-in desk & cathedral ceiling. Master w/cozy fireplace, fan, door to patio, crown, speakers & large walk-in. Master bath w/heated floor, speakers, 2 sinks w/marble vanity, make-up vanity, whirlpool tub, walk-in shower & towel warmer! Large bonus room up. Spectacular backyard paradise w/lush landscaping, concrete pool, hot tub, fire pit, 2 covered patios, open patio, built-in grill, fridge, gas burner & dog run! Full house generator, water softener, well for the sprinkler, security, central vac and 5-car garage!